« Win-Win Situation: Do Pitchers Really Pitch to the Score? Maybe the grass isn’t always greener on the other side? 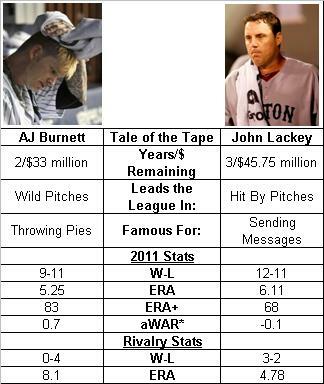 While Yankees’ fans have been lamenting the historically poor performance of A.J. Burnett, Red Sox Nation has been home to an even bigger bust, both in terms of performance on the field and zeros on the pay check. Following his latest meltdown against the Texas Rangers, John Lackey’s ERA ballooned above the six run level, placing him dead last (by over seven-tenths of a run) among all qualifiers in 2011. On a more historic scale, Lackey’s ERA+ of 68 ranks as the 65th worst rate compiled by a pitcher with at least 140 innings since 1901. In other words, Lackey hasn’t just been bad; he’s been down right terrible. 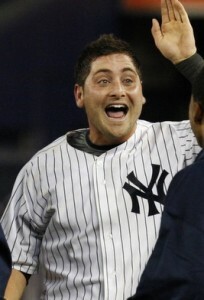 Somewhere, Francisco Cervelli is clapping his hands very loudly. Adding insult to injury from the Red Sox’ point of view is Lackey’s contract, which calls for the ornery right hander to receive $46 million over the next three seasons. By comparison, AJ Burnett only has two years remaining at $33 million, so financially speaking at least, the Yankees are in much better shape. That’s nothing to get too excited about, but in the Yankees/Red Sox rivalry, even small victories warrant a round of applause. Is there a Varitek – Posada comparison or did I miss that one? I think Posada is earning $333,333 per RBI. As compared to Varitek’s $62,500 per RBI. Wow, looks like the Sawx got a great deal and the Yankees made another bad investment . . . kind of like my Mattingly: HOF or Bust t-shirts.